Welcome to this weeks edition of Christians Behaving Badly. Our special guest this week is Reverend Terry Jones, of Gainesville Florida. 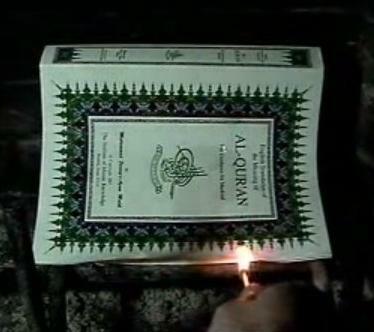 Reverend Jones and his mega church of about 30 or so loving followers of Jesus have announced that they will be burning the Koran on September 11. This is to further demonstrate their belief that “Islam is the devil’s religion”. He cites constitutional protection for this event. It’s the same protection claimed by flag burners. Those who’ve ever been involved in a sport that receives press coverage, have probably heard the term “Bulletin Board Material” This refers to negative remarks by a member of one team about an upcoming opponent. Invariably, the coach of the team that has been so dissed, will put the clipping containing said negative remarks on a bulletin board for his team to read, in the hopes of stirring anger and hopefully increasing the motivation of his own team. Coaches hate it when their players give bulletin board material to the press. I hope the government doesn’t try to prevent the good reverend, because he does have a constitutional right to do this. I hope he decides not to because it isn’t Christ-like. He should abide by the words of the one he claims to follow. 45 so that you may be like your Father in heaven, since he causes the sun to rise on the evil and the good, and sends rain on the righteous and the unrighteous. 46 For if you love those who love you, what reward do you have? Even the tax collectors do the same, don’t they? 47 And if you only greet your brothers, what more do you do? Even the Gentiles do the same, don’t they? 48 So then, be perfect, as your heavenly Father is perfect. From the “You Gotta be Kidding” Dept. WASHINGTON — A House subcommittee approved legislation Wednesday aimed at forcing college football to switch to a playoff system to determine a national champion, over the objections of some lawmakers who said Congress had more pressing matters on its plate. The bill, which faces long odds of becoming law, would ban the promotion of a postseason NCAA Division I football game as a national championship unless that title contest is the result of a playoff. The measure passed by voice vote in a House Energy and Commerce Committee subcommittee, with one audible “no,” from Rep. John Barrow, D-Ga.
“With all due respect, I really think we have more important things to spend our time on,” Barrow said before the vote, although he stressed he didn’t like the current Bowl Championship Series, either. The bill’s sponsor, GOP Rep. Joe Barton of Texas, said the BCS system is unfair and won’t change unless prompted by Congress. Thank you Rep. John Barrow, Democrat from Georgia for being the voice of sanity in a congress gone wacky. We’ve got double digit unemployment, banks still giving bonuses with tax money, and borders that we cannot seem to afford to secure. We now have congressmen in a sub committee trying to pass a law meddling in college sports? College sports is part of the entertainment industry. I sincerely believe that they have better things to do on our dime. The bill’s sponsor is Joe Barton of Texas. This is a republican; you know, the party of small government. Wait, did I say Texas? Well I guess that explains things. Football is the state religion of Texas. Hmmm… Does this mean they’re venturing into the realm of “Church and State? Ladies and Gentlemen of the Congress: Please stay out of College Football. I know Their championship system is lame, and perhaps for some, unfair. Maybe there should be a tournament. (but for Pete’s sake, they’ll be playing til March) Let them work it out. Let the consumers put the pressure on them to make changes. You guys have more important things to do. I’m filing this in the “Are You Kidding Me?” File. The AVMA thought it would be fun to have the fish throwing guys come over and do a little tossing for the entertainment of the conference goers. Seemed like a good idea at the time, but now PETA has had to stick there nose in and request that the AVMA not have the tossers come over with their fish. “It’s cruel enough to eat fish, but it literally adds insult to injury to use them as toys for silly stunts.” is the reason given for the request. What?! Do these guys not have more pressing issues to deal with? Whaling? Cosmetic Industry? Medical science animal testing? Michael Vick’s dogs? The fish are dead! Go after the guys that killed them. I could see if they were tossing live fish that were drowning in air, but protecting the dignity of dead fish? I don’t think any of their relatives will see it on TV, and be horrified by it. If that were the case, I’m sure we would have already seen lawsuits on their behalf. The thing that bugs me is that the Vets are about to cave in and cancel the fish tossing. Whatever. I was driving through an industrial park area and saw a sign posted that said: “No Street Racing 10:pm – 5:am”. Am I the only one who thinks this is pretty stupid? Does this mean that between 5:01 am and 9:59 pm, street racing is okay? I don’t know if this is county or city, but was it really necessary to spend the money to do this? Or have racers gotten out of their tickets by claiming they thought it was okay after 10 pm? I think that most people with average reasoning capacity see a speed limit sign and assume that it is against the law to race in that area. If two cars are at the speed limit or below, it isn’t racing, is it? I guess I would be okay with a sign that said no racing if they hadn’t put a time on it. I’ve seen signs that say blind persons crossing. I wonder how they know. Then there’s the braile buttons on the drive trough ATM’s. Scary. Several years ago I bought 2 studded tires for my car. A few years later, I went to the same store to buy another pair of studded tires. I was informed that they are now required to sell them in sets of 4. What?! “It’s a new regulation, a safety issue,” I was assured. Safetry issue eh? Is that why they still sell tire chains in sets of 2? I’m thinking the tire industry has a surprisingly strong lobby in Olympia. Maybe this is a little bit out of bounds for some people, but am I the only one who has to flush multiple times with the low flow toilets? Once just doesn’t seem to get the job done. So I have to give it a second flush. How much water do I save by flushing twice as many times? I’m all for conservation, but this just doesn’t seem to be doing it. Anyway, just give me an old fashioned water-hog and I’ll be a happy crapper er camper. This page took 1.791 seconds of computer labor to produce.